There it was...... A short message in my E-Mail in-box : "The Blue Angels are giving interviews on the Thursday prior to the air show. One of the Blue Angels Navy pilots, will gladly answer your questions. Please contact the Air Show Public Relations Office to make the necessary arrangements." Needless to say, I was promptly on the phone to schedule the interview, thinking that I might have to fight a horde of other journalists to get my name up in the list. After a few minutes, the interview is scheduled. I will meet with a Blue Angels pilot on Thursday, May 15, at 2 PM. "Once on the tarmac, beware of incoming planes! The F-16s should land soon." I imagined the look in my insurance brokers face if I called him stating my car was hit by an Air Force F-16 Falcon! 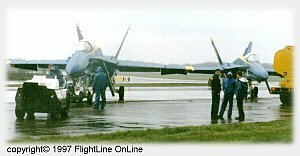 (the Squadron always take a spare Hornet which carries Media Representatives. 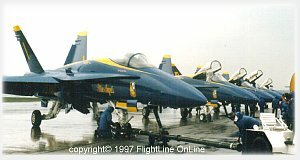 Its pilot, when not in flying duty, is the Blue Angels narrator during the Air Shows). Just in front of them, the huge Lockheed C-130 Hercules, affectionately known as "Fat Albert", transporting the Squadron cargo. This is the kind of sight one is not to forget for the rest of his life. Activity is heavy around the F/A-18s. Maintenance crews are preparing the aircraft for the flight demonstration rehearsal and everyone is performing tasks with surgical precision. A car drives up and we are introduced to JO2 (SW) Dave Fitz from the Blue Angels Public Affairs Office. He confirms that the Blue Angels are about to take-off for their practice flight and that we would be able to join them afterwards. He leads us to the tarmac centerpoint so we can have a better view of the show and adds we will witness a "low show" given the cloud ceiling and visibility we had at that time. Indeed, to be able to perform, the Blue Angels must have at least 3 nautical miles of visibility from centerpoint and a minimum cloud ceiling of 1,500 feet. At these minimums, the Blue Angels perform a limited number of maneuvers in what is called a "flat show". When the ceiling is at least 3,500 feet and visibility is at least 3 nautical miles, a "low show" is performed, which includes some rolling maneuvers. With a minimum ceiling of 8,000 feet and visibility of 3 nautical miles, the Blue Angels can perform their "high show", which includes all maneuvers. Here we are, ideally positioned just a few feet behind the Blue Angels Support and Maintenance crew. AE1(AW) Frank Maciag, Crew Chief Supervisor, wearing his headset is waving to Lt. Doug Verissimo, USN, Blue 7 and narrator for the Montreal Air Show Blue Angels flight demonstration. Lt. Verissimo starts what was to be a very inspiring narration. (BAPAO agreed to give us a copy of the Lieutenant's words, FlightLine will provide our readers with this text in an upcoming installation of this story). Listening to his uplifting introduction, we quickly forget the strong and cold winds blowing over Mirabel International Airport. 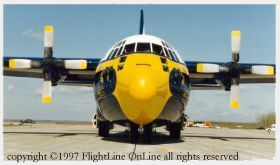 The first aircraft to take off will be Fat Albert. This Lockheed C-130 Hercules, flying in the Blue Angels colors, is operated by an all-Marine Corps crew of three officers and six enlisted. It transports all maintenance and support personnel, and equipment necessary to support the Blue Angels flight demonstration team. Fat Albert carries a normal show-load of 25,000 pounds of sophisticated parts and equipment, 46,000 pounds of fuel, and a specialized maintenance and support team. We learned from Lt. Verissimo that Fat Albert was going to demonstrate the Jet Assisted Take Off (JETO). Eight rockets are attached to the sides of the aircraft just ahead of the rear paratrooper doors. Using this additional thrust, this huge aircraft is able to take off in less than 1,500 feet, and climb at an angle of 45-degrees to an altitude of more than 1,000 feet in minimum time.